Most costume designers have a degree of specialism – be it certain historical periods or broader styles. But few can claim a career largely based on and celebrated for the depiction of race. With past triumphs in Selma, Malcolm X, Amistad and Do the Right Thing, Ruth Carter was a natural choice for the major Marvel production of one of the world’s few black superheroes, Black Panther. To avoid simply appropriating different African cultures to create an unconvincing collage of costume the production took care to establish a whole alternative universe with histories and customs unique to each fictional tribe. 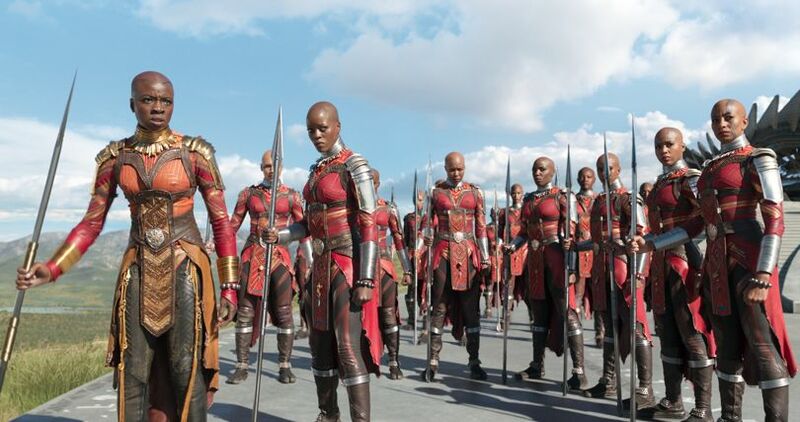 “I imagined that there would be special Wakandan artisans in charge of creating the Dora Milaje’s armour,” said Carter. “Once a girl reached that special level of fighting, the artisans would create her bespoke armour and present her with it in a ceremony.” The armour is all red with patterns drawn from real-life sacred artworks. The bright red was created using a traditional technique she found while travelling through South Africa of binding leather with thick thread. These ancient techniques were combined with very modern prop making. Queen Ramonda played by Angela Bassett wears a shoulder mantle made from fibres bound together in the world’s largest 3-D printer in Belgium. Her crown shared this process as it “had to be totally cylindrical, so, unlike the hand-crafted uniforms of her armed forces, it would stand out for its pure perfection”. No doubt Black Panther offers a huge new world for cosplayers to explore. The new Black Panther suit seems far more organic and anatomical than its X-men predecessor in 2016 and so a black catsuit starting point makes sense, although it seems as ever the essential supplies to recreate many looks from the film will be EVA foam sealed with PVA glue, liquid latex and leather. Ironically Carter’s 100-strong team could never have enough time for such a project and admitted that they could have achieved more with effective shortcuts, saying that their authentic buckles could have been easily replicated with Velcro!